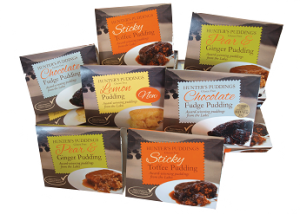 Hunters Puddings’ is a small family run business based in Kendal on the edge of the Lake District National Park. Created by Sarah Hunter in her home kitchen, Sarah’s puddings have won awards in blind tastings at the highest national levels, against non – gluten free alternatives. The ‘Hunters Puddings’ philosophy is simple: A gluten – free diet does not have to mean second best.